‘The Snail ate the mail‘ is a children’s mystery, travel adventure picture book predominantly targeting 4-7 year olds. The story starts at the beginning of the week, with Chris and Bill receiving a postcard in their letterbox from overseas. The mystery is created by the industrious efforts of the letterbox’s resident hungry snail, eating the country of origin and part of the senders name from each postcard. While Chris and Bill may struggle to identify the country of origin, the beautiful illustrations depicting well known icons and landmarks as well as map, flag and greeting from each country will ensure children have numerous clues to work out where the postcard is from. Children will be captivated by the tactile nature of this second book in the mystery, travel adventure postcard series. The mystery continues through the industrious efforts of the letterbox’s resident hungry snail eating part of the sender’s name from each day’s postcard. While the postcards recipients continue to struggle to identify the country of origin and senders name, the beautiful illustrations depicting well-known icons, as well as map, flag and greeting from each country in question will ensure children have numerous clues to work out where the postcard is from. 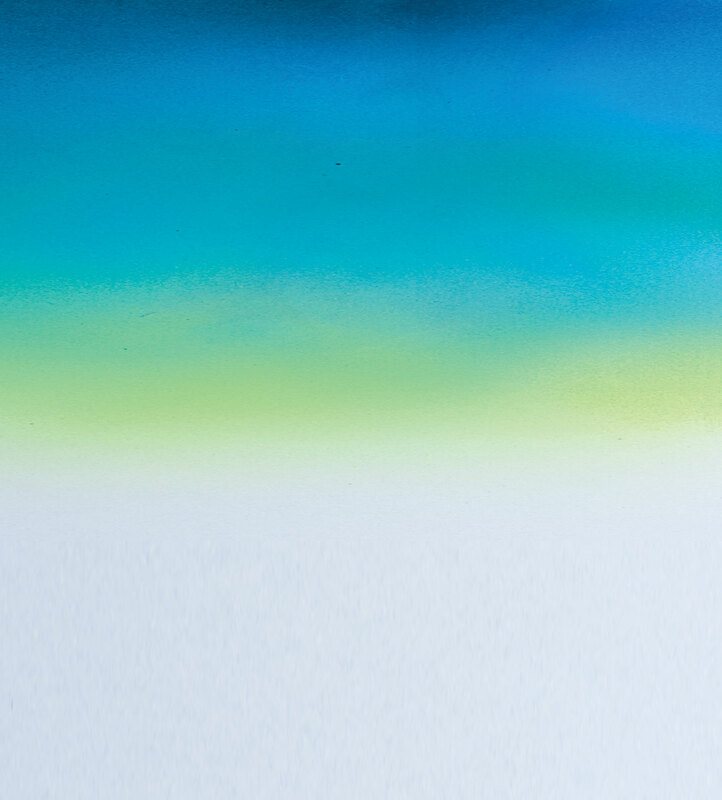 Hardcover, tactile, gloss coloured flip-out pagers. Target audience 4-7 year olds. “The illustrations have been undertaken in such a manner that not only will the eye be pleased by the beautiful colours and artfully crafted symbols of each country, subsequent perusal of the book will result in the discovery of the fine details that heighten the aura of authenticity of each postcard. There are a number of factors that will appeal to both parents and early childhood educators. For the younger audience there is the appeal of the colourful illustrations, flip-out postcards and repetition. The early reader will appreciate the short repetitive sentences with the introduction of only one or two new words at the end of each sentence. 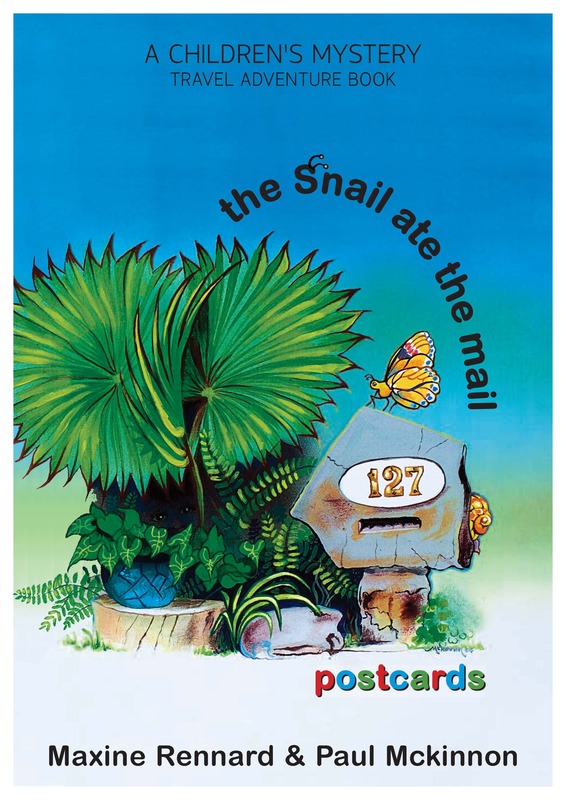 The Snail ate the mail had broad appeal for all of our students, especially the younger ones. The students were fascinated by the fact that the story itself was grounded in stories from Maxine’s own family stories. Maxine’s offer was a wonderful fundraising opportunity for the school that required no financial outlay by the school, minimal organization, no paperwork and no hard sell by Maxine. Our students eagerly took up the offer, and they were very excited when the books arrived. Thank you, Maxine, for sharing with us a glimpse of your family’s history through this beautiful story. …It’s a delightful book featuring postcards and colourful visual imagery. The illustrations by local illustrator Paul McKinnon feature maps, flags, national dress and landmarks. Using these clues, young readers need to identify the postcard’s country of origin. There’s some wonderful features of this book such as repetition, flip out postcards and tactile snail trails on each page for kids to touch. Recently Maxine Rennard, a local author, presented her new book The Snail Ate The Mail, to the students at St Patrick’s Primary School. Maxine wrote the book for her son Lachlan, who loved books but was sadly diagnosed with cancer when he was four years old. The Snail Ate The Mail is based on the experiences of her great grandfather as he travelled the world. 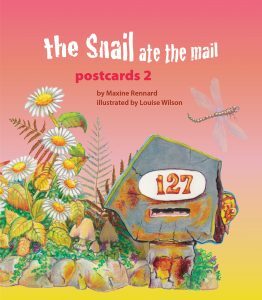 Maxine remembers getting postcards from all of the different countries he visited but she couldn’t find out who the postcards were from because there was a snail living in the letterbox who kept eating their mail. The story is based on a real letterbox that exists at a house in Swansea. Maxine’s great grandfather built the mailbox out of stones found at the beach. The students of year 5-6 recommend the book for younger children, aged 8 and under. Professor Lovat, of the University of Newcastle, said: “The illustrations have been undertaken in such a manner that the eye will be pleased by the beautiful colours and artfully crafted symbols of each country”.